After a lot of research, I found a great article written back in 2000 by Eleanor Klinvas, specially about making multilayer cheesecakes. Preheat the oven to 325F. Butter 9-inch springform pan with sides at least 2 3/4 inches high. Mix cookie crumbs and melted butter, combining well. Press crumb mixture evenly over bottom and 1 inch up side of pan. 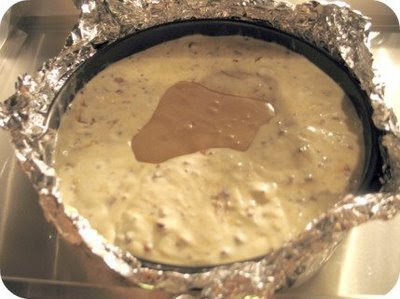 Wrap outside of pan with 1 large piece of heavy foil, making a water tight seal. Make for 6 minutes. Set aside and cool completely. Before you start the cheesecake batter, you should get everything ready for the water bath. You'll need a roasting pan that's big enough to hold the spring form pan in both width and height. While you're preparing the cheesecake, boil a large kettle or pot full of water. Preheat the oven to 325F. In a standing mixture, cream the cream cheese in large bowl on low speed until smooth for 1 minute. Add sugar and mix until smooth, about 2 minutes. Scape bowl and beater. Mix in flour and mix just until the flour disappears. Add eggs, 2 at time, mixing until batter is smooth and no traces of egg can be seen, about 1 minute. Mix in vanilla and cream for about 30 seconds. Get 2 medium sized bowls, preferably ones that have a pouring spout. Pour 2 cups batter into each of bowl. Stir dissolved coffee into mixture in one of the medium bowls and stir well, until the mixture is an even color. Set aside. 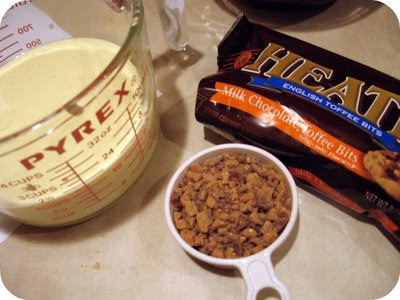 Mix the crushed toffee into batter in second medium bowl, mix well, and set aside. Mix melted chocolate into the batter that's left in the mixing bowl, stirring just until chocolate is incorporated and no white batter shows. 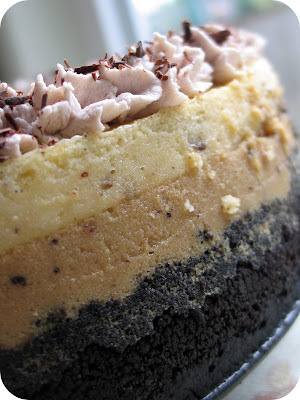 Pour chocolate batter into chocolate crust in prepared pan. 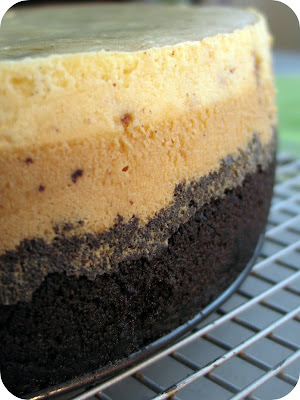 Place cheesecake in large baking pan with at least 2-inch high sides and place in oven. Pour hot water into large pan to reach 1-inch up sides of springform pan. Bake 20 minutes. Carefully slide oven rack out several inches. Pour reserved coffee batter all around inside edge of pan. Batter will flow evenly to cover top of cake. Bake 20 minutes. Very carefully, remove everything from the pan (roasting pan, water, and cheesecake). Note: If you have a bad back, don't be a hero and ask for help because it's heavy and the water is going to be near boiling. Cool cheesecake in water bath 1 hour on a heat proof surface, covered loosely with paper towel. Carefully remove cheesecake from water bath. Remove paper towel and cool 1 hour more on a wire rack. Cheesecake should feel cool to touch. 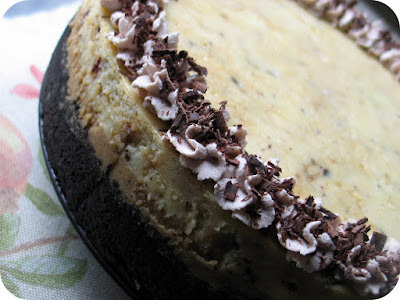 Gently run a thin-bladed knife around the edge of the cheesecake. Unhinge the latch on the spring form pan and gently remove the ring. Cover with plastic wrap and refrigerate at least 6 hours or overnight. 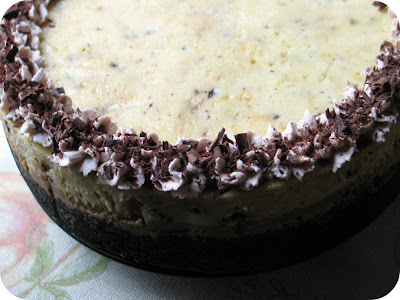 Serve the cake with whipped cream and chocolate shavings or just plain. When slicing the cake, be sure to clean the knife after each cut. This will ensure prettier slices. Would I Make This Again? Without a doubt! 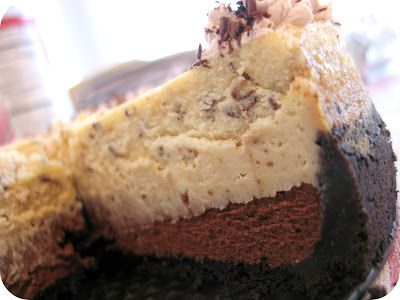 I was told by several people that this cheesecake was the best one they've ever had! Plus, I'm excited to try this recipe with other flavor combination.